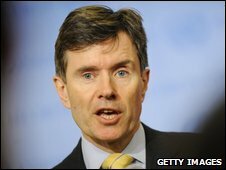 Tall, dashing and an astute judge of character, we profile Britain's ambassador to the United Nations Sir John Sawers, who is to be head of MI6. At the UN Correspondents Association annual dinner one Christmas, Sir John Sawers laughed heartily as he saw how journalists had compared him to James Bond actor Pierce Brosnan. Tall, dashing, and an excellent dancer, Britain's Ambassador to the UN could indeed be a character out of Ian Fleming - and now he becomes the head of Britain's Secret Intelligence Service (SIS). As Downing Street coyly noted, Sir John is "rejoining" the SIS - no details were given about his previous career in MI6. But as UN watchers have often observed, Sir John is an astute judge of character, a quality invaluable in both diplomacy and spying. 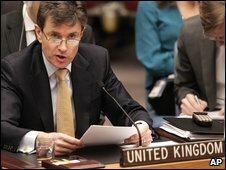 An experienced negotiator, he has been an effective advocate of Britain's interests at the UN for the past two years. Britain is an influential power at the UN, with a permanent seat on its Security Council, the body charged with maintaining international peace and security. The five permanent members - Britain, France, the US, China and Russia - have the power to veto decisions they do not like. Britain's mission at the UN will often draft resolutions - holding the pen, as it is known in diplospeak. So as an ambassador of one of the permanent five, Sir John has played a central role in the key resolutions negotiated here over the past two years - on Iran, North Korea and the Middle East. The allies from the end of World War II, known as the P5, tend to set the agenda for the council's discussions, and dominate the proceedings, often to the chagrin of the 10 countries who are temporary members. Confident with the media, Sir John is a regular at the stakeout, the microphone in front of the UN Security Council where ambassadors come to give on-camera statements to journalists. In often complex negotiations, he has mastered the art of delivering sound bites which sum up both the issue and Britain's position. That is no mean feat in a place where baffling acronyms and arcane procedure are the order of the day. Sir John is regularly in contact with the UN Secretary General Ban Ki-moon, who is known to listen carefully to his advice. The worlds of politics and diplomacy overlap at the UN - for example, the US Ambassador to the UN Susan Rice is also a member of Barack Obama's cabinet - and Sir John is clearly at ease in both. He is not in the stuffy, Foreign Office mandarin mould. On a trip to Darfur in Sudan, Sir John was the only ambassador to go inside a camp for people displaced by the fighting, amid mutterings about how diplomats had come all the way from New York and not seen how people really live. Leading by example, the man who now becomes C was showing the importance of intelligence-gathering.